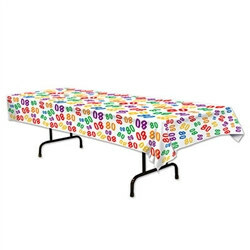 This vibrant "80" Tablecover is perfect for 80's theme party! This inexpensive party supply can be used to decorate tables, walls, or doors. Try decorating with this "80" Tablecover for a love one's 80th birthday as well! This 80 tablecloth was awesome. I USED ONE SO FAR AND IT LOOKED GREAT ON THE TABLE.. WE WILLL USE THE REST THIS WEEKEND., ASK ME AGAIN AND I WILL GIVE U A BETTER ANSWER.. ALSO FAST DELIVERY..
Couldn't find anything like this anywhere. Love it!